58 Acres of Family Fun! Seller Financing with 25% Down! 5 miles off Interstate 81, just over 3 hours to NYC and Philadelphia, 5 hours from Washington DC, Boston, and Baltimore and on the edge of a 539 acre State Forest! At the ripe age of 78 and some 30 years operating this campground, these sellers decided it’s time to retire! Lucky you! It’s 58 acres are wooded and hilly, breathtakingly beautiful and easy to operate. Nearly 64 seasonal guests, fun family activities, swimming, fishing and boating lake, gated entry and so much more! We stayed here over Labor Day weekend and boy were we surprised. This place is the absolute best campground we’ve been to in a long time. The owners are so nice, they actually stopped by the site to see how everything was. We enjoyed the quiet, shaded sites and the easy access to the lake. We have been camping here for 7 seasons. No other campground provides such an environment. Always clean, peaceful, and relaxing. Great fishing! Don’t need to get a license, they have one. The staff is really nice and helpful. Seems there are always activities on the calendar to keep the kids busy. I used to take my kids here years ago and coming back is just like coming home! The owners, whether they’ve known you ten years or ten minutes, treat you like family. Cabins are very reasonable and they are very well kept as is the entire campground. The cabins and RV’s are very clean and well kept. The lake is beautiful and the grounds were immaculate. It’s the “perfect” size and place for kids and families to explore, relax, and make fond memories. We will return!! 10 Years New with 50 Gorgeous Acres! The County is nestled on the southern banks of a Great Lake and right in the middle of two major cities with an abundance of activities! While the park is a destination in and of itself, the area provides guests the opportunity to cruise along country byways, scenic waterways and to get active and stay active in the great outdoors! This 10-year new park was built by the current owner with the help of a well-known park designer. It took him 2 years to construct the first 108 sites after he obtained the proper permits and approvals. Each year they add more amenities and upgrades. Recent additions include a new playground, over 250 trees, roadways resurfaced, an additional 24 RV sites and a new bathhouse and laundry facility. This one will not disappoint you! Shows tremendous pride of ownership! These owners get to spend morning coffee breaks listening to the distant waves crash on shore giving them the feeling of being on the ocean! With a fantastic view of the big lake, 8 charming acres full of huge trees giving way to ample shade and gentle breezes, why would you look any further? The campground is just a hop, skip and jump (1/2 mile) from a huge lake that offers visitors a chance to catch the big one, go for a swim or casually boat the expansive shoreline and has a right of way access. The marina is a quick jog down the road. These owners are overdue for retirement and ready to pass this on to a younger couple with more energy. Over $7,500 in improvements were added in 2017. A generator that will power the sewer pumps and owners home and a 20x21 carport used as a storage unit in the winter and a community gathering area during the open season. A no hassle, no stress, easy to operate business! Are you tired of looking at your backyard? Then you should take the time to come, look and buy this backyard – all 110 acres of it! It can be yours to expand to your heart’s desire on its undeveloped 56 acres! Imagine the possibilities! This is a destination park with a high seasonal base in a private and secluded location with lots and lots of weekend family activities. Providing the perfect location is just the start. Not all treasures are found in stores. Non-Disclosure / Confidentiality Statement required prior to viewing property and providing additional information. Ready to leave the crowds and get off the beaten path? Then pack up, lock up, abandon your chores and grab the kids or not and give us a call to schedule a tour of this beautiful park! Caution: As you exit the Interstate the land begins to open up to endless angling options, so be prepared to be swept away into a fishing paradise! The Region is central to some of the States’ best hiking experiences from scenic beginner trails to a challenging summit, this area offers hikes to meet all levels. With over 25 lakes, rivers and streams too numerous to mention, this area is BIG for outdoor recreation! Here, you can swim, boat and fish a different location every day and never feel overcrowded! The parks 24 acres are mostly wooded with a variety of hills and level land. 6 of those acres are currently developed and include a pavilion, owner’s quarters with an office/registration area, a storage barn, bathhouse with 4 individual restrooms, laundry room and a roughed in area for future sites. The current owners had the 24 acres surveyed and have an approved plan filed with the DEP for a total of 80 sites. They also have engineered septic designs for the future expansion. Why ride the roads when you can ride the dirt? Guests can ride from the park grounds to thousands of miles of interconnecting trails! Winter cabin guests have the same ability with their snowmobiles! Trust me, you will dread returning home. Now is the perfect time to make campground ownership a reality and make this park your year-round home! Located three miles off a major north/south interstate in a beautiful countryside setting, where guests to this park get the opportunity to camp under the stars! It’s a place where guests always find fun, family events and activities. With a ten-minute drive to a State Park and a National Forest, visitors can hike on 11 miles of trails while anglers can fish and golfers can enjoy a challenging 9-hole golf course. Located in the Allegheny Plateau with breathtaking views and tremendous vistas! This park boasts a healthy amount of seasonal guests with plenty of sites left for weekenders and overnighters. So peaceful and yet so alive with lots of activities and family fun! After 22 years of ownership, these sellers are ready to let the next person enjoy the experience of campground ownership! The camp is closed in winter providing the perfect opportunity to enjoy sunny winters in the warm South! If you enjoy a carefree pace in a rural setting, then you’ll love this beautiful campground located on a scenic river! The area is full of charming towns and vast countrysides filled with gorgeous scenery and year-round events. This campground is perfectly positioned for weekend getaways and motorcycle groups, with 7 acres along a river popular for fishing, water sports, and canoeing and a total river frontage of 835 feet. Boat ramp and beach area for docks. These owners have taken this park from a sleepy seasonal campground to an exclusive motorcycle friendly campground. These groups that book reservations are older folks who are well-educated and have significant disposable incomes. While this could transition to a family campground, bear in mind that there are no amenities for children such as swimming pools or game rooms, so budgeting would be a priority. The cabins and RV rentals are not included in this asking price, however, can be included for additional $$’s. Please call for further information. Located in a desirable location with a strong reputation and spectacular lake views, these owners business philosophy has been different than most: it hasn’t been about making a profit, but more about having an affordable, seasonal retreat. Sellers are willing to Owner Finance subject to buyer financial capabilities. One of a kind, 167-site, resort style campground with multiple water features including a half-mile of river frontage. This impeccably maintained development offers a complete site-mix including full hookup RV sites, one and two room cabins, seasonal sites, wooded and water front tent sites as well as primitives ites. Guests love our amenities including the full-service camp store, bath houses, laundromat, swimming beach, kayak & paddleboat rentals, recreation area, playground, game room and trout fishing in two mountain streams. The campground offers the utmost in tranquility while remaining so close to many of the region’s most popular attractions. The 5-month season runs from mid-May to mid-October. Owner/operators residence is an extra-large manufactured home situated on a beautiful Creekside site. These owners thought of everything to make this park a popular family destination with so many fun things to do! This park is easily reached via a heavily traveled Interstate and within easy distance from three large cities. There is forest-covered mountains in every direction, and endless opportunities for outdoor adventure because this property is in close proximity to a state and national forest! Guests have plenty of hiking trails, canoeing, kayaking, horseback riding, ATV trails, ancient giant trees and fishing opportunities! This park is impeccable in every aspect! From maintained grounds with a forested feel and weekend activities to a super huge heated pool, new bathhouse and so much more! The facilities are highly rated and second to none. This is one you’d be proud to show Mom and Dad! Rustic Mountain Treehouse Resort on 56 acres bordering 750,000 acres of the White Mountain National Forest. 3 Treehouses (one of which is believed to be the largest in New England), 5 story castle tower on the private mountaintop for an ultimate glamping experience. This property boasts absolutely amazing 360-degree views of the Western Maine Mountains and the White Mountains of New Hampshire. We also have an 18 hole mountain side disc golf course and miles of hiking, ATV and cross-country ski trails. It is centrally located between 3 major ski resorts. Also with this property comes an office/apartment, 2 camper trailers, 2 ATV’s, a sawmill and much much more! Expansion Potential! Perfect for developing an RV Park and Campground. Create your perfect campground with this private, secluded property on 56 rural acres. Currently operating as a retreat center, the location has easy access to major highways. Peaceful and serene, a stream runs through its center, inviting visitors to wander and reflect. Hiking/biking trails crisscross the property over fields, bridges, hillsides and through wooded areas. A fishing pond on the property is enjoyed by all for fishing and row-boating. Recreation areas are provided here, and also at a nearby State Park. Other significant structures: Rental Unit Mobile Home; Equipment Barn (24 X 30); Modular Sewer Treatment Plant; Water Well; the land has an extensive infrastructure with room for expansion. A caretaker ranch home on 5 adjacent acres may be available for purchase separately. Located in the northern Adirondack Mountains region and just a half mile from a natural fresh water lake measuring some 110 miles with pristine shorelines, public boat launches, ferry boat rides to Vermont and New York resort areas. This park is also a convenient ¾ mile from the Interstate. Open May 1 to October 1 with nearly half of the sites rented on a seasonal basis. A 50% repeat clientele is largely made up of Canadians coming to the area for shopping and vacationing and they typically stay at least 2 days to exempt them from paying duty fee’s. Casinos, chasms, gorges, lakes, rivers, marinas, beaches, fishing, canoeing, river rafting, golf courses, restaurants, malls, speedway race track and airports are just a short distance away. So convenient to EVERYTHING in a quiet, peaceful and clean RV Park! Big rig and family friendly, cozy secluded RV sites, clean and comfortable! Destination Area with over 800,000 Annual Visitors! Guests to this park have the opportunity to enjoy a 14,000-acre backyard just a short 8 miles away! This State Park is a world unto itself and isn’t your average State Park. Hiking, whitewater rafting, horseback riding and waterfalls galore are just a few of the features that made this the top pick of the USA! 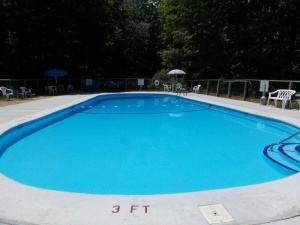 This campground offers season-long fun family activities, connect to nature tent sites, cabin rentals, a mix of woods and meadows, an on-site pond for swimming, a fishing pond, and a fully stocked trout meandering creek. Attracting over 150 seasonal guests and those who want a quick getaway from two large metropolitan areas just one hour away. You’ll have to take the time to pore through all that’s here to really appreciate this one. It will be difficult to find another park that measures up to all that this one has to offer! Dream It, Own It! So Affordable! This area is an outdoor enthusiast dream! Lakes, rivers, ponds, forests, trails, and open hills are some of what nature has to offer. From canaling, scuba diving and canoeing to ATVing and ice climbing, this place attracts visitors from all over! This low-key campground is in a perfect position for an energetic couple to step in and take this to the next level. The park is currently being operated by one person who enjoys maintaining and running the day-to-day operation, however, is finding it too much to handle solo. Expanding the camp store, adding cabins and additional tent sites, and advertising more aggressively would be great starters for the new owner. Currently there are two income sources with a huge potential for a third source to be re-opened! The property consists of 66 (+/-) acres with the campground occupying about 10 acres and the mobile home park (adjacent to the campground) on about 10 acres. This property is in line for an overflow of development from which there is a demand for high-end residential and seasonal properties by well-to-do folks from NYC, Connecticut and Europe. Location, Potential, Location! The restaurant has a history of on and off use. Used at one time on weekends only for breakfast, in another season it was operated as a deli and for two seasons a dinner restaurant. Business was good, however since these owners purchased it for a lifestyle, the restaurant business interfered and they did not want the extra work involved with the day to day operation. This could be re-opened on a full time basis and these owners claim there is a need for a dinner restaurant in the area. The main building is “L” shaped with a 28x70 recreation hall and adjoining café (28x30) on one leg. On the other is the camp store, arcade, storage room and large work shop. An owner’s 2/1 apartment occupies the upper level of this building. The recreation hall is underutilized and as with the restaurant, younger and more motivated owners could capitalize these and other areas of the business. Located in a National Heritage Corridor which is half the size of Grand Canyon National Park and more than ten times that of Acadia National Park. Forest and farmland make up over 70% of its nearly 700,000 acres, yet it lies only an hour from 3 of New Englands largest urban areas with nearly 25 million people! The area is easily accessible to all the major markets of the northeast and is less than an hour’s drive from the coastal beaches. It is also within easy driving distance to ski resorts, lakes, streams, hiking trails, fishing, and hunting. Connections to and from the region are well served by a complete network of local and state highways, interstates and turnpikes. A commercial airport is 40 miles away with scheduled service from all the major airlines. The campground provides a natural forest camping environment with planned activities every weekend from bingo to barn dances. 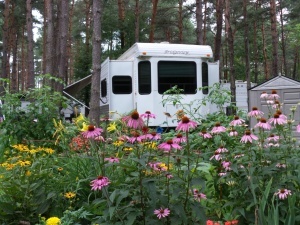 These owners have operated this campground for 30 some years and are ready to retire. They have kept this as a small, quiet family campground but the potential is unlimited with its proximity to some 25 million people! So Peaceful and Beautiful! Looking for Stress Free? This park has been a part of these owners lives for some 37 years, putting them well above the national average as campground owners! Made up primarily of seasonal guests and currently welcoming a third and fourth generation of happy campers! This stress free park is perfect for the person wanting to slow down or for the person wanting to take it to a higher level, which could include adding a swimming pool, miniature golf, full service cabins, WI-FI, more planned activities and so much more. The draw to the area is the State Park. Everything about this State Park is BIG! Touted as one of the most visited state parks in the state with a Reservoir claiming over 17,000 acres of water! Guests at this campground have a short 1-mile drive to the lakes boat ramp and 5 miles to the main swimming beaches. So much to do in such a great area of the state. Location, location, location! These owners have worked extensively to ensure a sound infrastructure with upgrades to the electric system, 2 upgraded water systems and water drainage systems. Every improvement has been done with a long term vision. This campground is sure to impress you! Visits to this business are by appointment only and require the completion of a Non-Disclosure / Confidentiality Agreement. Amazing, Immaculate, High Destination Area! Each year over 1 million people visit this Lake area and this amazing resort sells a lot of fun to its high base of seasonal campers! Located in one of the most sought after destination area’s in the state and just around the corner from access to a popular boating and fishing lake, which is this resorts significant marketing feature and why it operates from a waiting list! Keep in mind that this area is not limited to the lake area. There are thousands of mile of trails for hiking, running, mountain biking, horseback riding, ATV rides, a large concentration of caves and caverns and thousands upon thousands of acres of pristine forests, wildlife and so, so much more! This area boasts a visitor loyalty in excess of 90%! Because of its location, it places this park within easy driving distances to most major markets in the Mid-Atlantic region, including Harrisburg, Pittsburgh, Washington DC, Baltimore, Philadelphia and New York Metro. Since its purchase in 2006, the new ownership invested in capital improvements each year including additional sites, upgraded water and electric services, remodeled bathhouse, pavilion and guest laundry room. More recently, updates completed include an iron treatment system, remodeled cabins, WI-FI service and a new bathhouse trailer. These owners continue to maintain a family atmosphere through policies, restrictions and swipe care security gates, and they continue to maintain a high level of customer service and value, which keeps its customer demand high. There are two kinds of people; those that want to live on the lake and those that actually do. Want to know why lake living is second to none? Let me enlighten you, but be careful, it will make you wish this was your home. Living on a lake is an amazing lifestyle! There’s something magical about living on the water. If you buy this campground and have kids, they’ll never be bored. You can tell your spouse to “go jump in the lake” and he can literally do just that. People always gather where land and water meet. Nearly half of the sites are occupied by seasonal guests and when the campground closes for the season you get it all to yourself! When it comes to outdoor fun, few things beat the thrill of exploring nature on an ATV! These rugged vehicles are virtually unstoppable, are enormously popular and this park has direct access to the trails! 22 Acre Lake Included in the Purchase! Ever dream of owning your lake? Here’s your opportunity! Spread your arms wide, take a deep breath and open yourself to the limitless possibilities of expanding this parks opportunity! Its a campers paradise with its 22-acre lake, paddleboat and canoe rentals, a beaver pond and an ever-expanding seasonal base! The current owners purchased this in 2012 and absolutely enjoy the ownership and day to day operations of the business. Unfortunately, the other family business is warranting more of their time with the retirement of their parents and they cannot continue to spread themselves out over the two business. Non-Disclosure / Confidentiality Statement required prior to viewing the property and providing additional information. 72 Acres and 50 Mile Views! Open April 1 to October 31 giving a new owner 5 months to travel, recharge and reconnect with family. The parks 72 Acres has drop dead 50 mile views into the neighboring state. This vast region consists of hills and valleys with spectacular scenery! Driving Range on site for the golf enthusiast. Located three-quarters mile off a major east/west interstate connecting this park to four huge cities, with driving distances of one hour to just over 2 hours! Bring along the garden gloves because this owner has outdone himself with vegetable and fruit gardens! Tended and loved by the owners and the seasonal guests! From tomatoes, asparagus and corn to apple, plum, peach and cherry trees! Not to mention the 16 blueberry bushes. Plenty for everyone! Visits to this business are by appointment only, arranged through The Campground Connection and will require the completion of a Non-Disclosure / Confidentiality Agreement. Some Places Just Feel Right and This is One of Them! It’s a getaway within a getaway, so rise and shine and get ready to visit this 60-acre slice of paradise! Located in the rolling hills area of the state and just 40 miles from a large city. Traffic jams are non-existent and its secluded but popular location is the draw for its 115 seasonal guests! Planned weekend activities, the pool, fishing ponds, mini golf, playground, recreation hall and the lazy brook keep the kids active! A River Meanders Through It's Incredible 42 Acres! It’s a super cute park all snuggled up on 42 big acres with prime river frontage and boat slips! It’s right across the river from a wildlife refuge and on a river toted as the best fishing in the state! Guests come to surround themselves in natures playground, hike one of the many nature trails in the area and catch a glimpse of a resident bald eagle. This was the quietest and most picturesque place we have camped at for quite a while. Very clean and tidy. I recommend it to anyone who wants a base for exploring this region. Awesome campground, quiet and peaceful. Kayaked right out of our spot and saw Eagles right after we got out on the water! Awesome spot enjoyed the cottage. Plenty of room. Want to stay longer next time. Can’t beat having the water right out the front door. The 2 huge modern cottages they have are exceptional, and the sites are large and private. Overall a great place to camp with fishing, boat access, swimming pool. Always look forward to camping here. Surely one of the better places in the area.